Sports is an album that I’ve listened to religiously since its release in 2012 and for good reason. 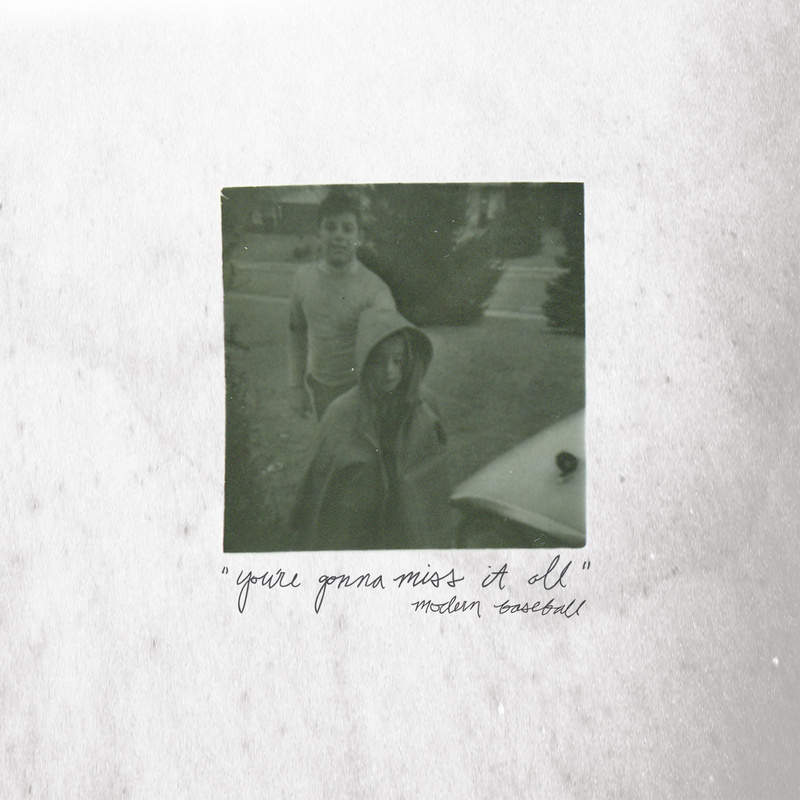 Modern Baseball’s debut full-length remains one of the most relatable and intriguing releases of recent memory, and expectations were high for its follow-up. As expected You’re Gonna Miss It All doesn’t disappoint, and if you’re yet to hear it you can stream it here. Modern Baseball do things differently. They did on their debut and they continue to do so on You’re Gonna Miss It All, largely for the better. They borrow from the wit and sarcasm of …Is A Real Boy Say Anything and pair it with upbeat and dynamic instrumentals, making for a remarkable collection of short, snappy and thoroughly memorable self-dissections. For the most part You’re Gonna Miss It All is a sobering personal commentary often covering themes like alienation, loneliness and regret, all of which are covered with trademark Modern Baseball charisma by vocalists Brendan Lukens and Jacob Ewald. At times You’re Gonna Miss It All is perhaps too much of a high school melodrama but there’s an unmistakable charm to the pictures they paint as socially awkward bystanders at a party whilst those around them make out. Modern Baseball’s second album is highly relatable, and it captures the highs and lows of being a pessimistic wallflower pretty damn well, and does so on the aptly named Rock Bottom where the band are at their best in terms of songwriting. Charlie Black is another highlight and radio friendly rock song, with the records most anthemic chorus as cries of ‘Woah-oh tragedies got my heart a beating’ ring out. For a personal track about loneliness it’s deliciously upbeat and will go down very well at shows, showing just how much energy and emotion Modern Baseball can pack into a short track. Only one track on You’re Gonna Miss It All passes the three-minute mark and it’s Going To Bed Now, a jaunty number with catchy bass and a surprisingly retro feel before the chorus kicks in and drums crash underneath directly confrontational lyrics, before asking ‘What do you call someone who calls you out on DIY?’. You’re Gonna Miss It All is pleasingly tongue in cheek and it makes for an entertaining listen, with something different being offered up each time. Second track Broken Cash Machine marks the records shortest entry and it surges along after a building verse, also making for one of the records catchiest tracks both vocally and instrumentally as rhythmic drums and subtle bass underlie reflective lyrics as Ewald punches himself repeatedly. If one thing is blatantly clear here it’s that Modern Baseball have a very smart approach to songwriting and self-expression, and at its best You’re Gonna Miss It All is genius from a band who pour every inch of themselves into their music. Will Yip’s excellent production helps breathe a little more life into the instrumental side of You’re Gonna Miss It All and this is where the record really improves on the bands past works. The instrumentals are more adventurous, occasionally opting for a heavier approach as they do so in the final twenty seconds of emphatic opener Fine, Great as melodic guitars ring out over crashing drums. A few tracks begin subdued and mellow before turning things on their head and exploding into life and there are some nice touches throughout, most noticeably through backing vocals (Two Good Things) and the passionate verse drummer Sean Huber gives on Your Graduation. Sixth track Notes and closer Pothole slow things down, with the former being a relatively calm number that occasionally jumps into life over crooning backing vocals, making for the records most poignant song, with excellent lyrics (‘She was a brick boot swimming lesson in the deep end of my adolescence’). The final track is a largely acoustic number, sounding vulnerable and nostalgic in a way similar to Tommy Bowers, creeping along behind personal lyrics and delicate vocals. It’s a great way to end a great album, acting as a direct contrast to the intensity of equally excellent fourth track Apartment. My main and only real criticism of You’re Gonna Miss It All is that maybe it doesn’t change enough. Sure it’s a step up from Sports. but I was hoping for a little more. Lyrics are still painfully (and delightfully angsty), as they are on Your Graduation and they’re also still covering the same scenarios in the same sort of way, although they do cover them exceptionally well. Despite more adventurous styling’s song structures are still similar, although they are a little more advanced. Considering how good their debut was it’s a small criticism, and Modern Baseball are good enough at what they do that it doesn’t really matter. You Blew It! got it spot on with their second album last month, and maybe Modern Baseball would have benefited from similar strides forwards, or at least experimented with some longer songs like they did on their debut. There have already been a lot of stellar releases this year and You’re Gonna Miss It All is another to add to the list, taking everything that made Modern Baseball’s debut an instant classic and tightening things up despite not taking any huge strides forward. Sure, when a band finds a formula that works there’s no reason to change it and it comes as a huge relief that Modern Baseball’s approach remains refreshing and thoroughly entertaining even without developing too much. Pick this up and enjoy it, because you’d be a fool not to.